There's something about spiders that gives most people the creeps, instilling a sense of fear and loathing upon seeing one. It's as though there's a part of the human brain that perceives the form of a spider as dangerous or threatening. Perhaps those deep dark feelings we get when we see a spider are echoes of an ancient human behavioral response known as instinct. Most of the thousands of species of spiders on this earth carry a venom that is virtually harmless to humans, but there are a few species which carry a deadly venom. Based on primitive human experiences a permanent message has been embedded in our genetic make-up, one that warns us that spider = danger. And when we see a spider that is as large as a dinner plate, we get the creeps big time (or maybe it's just me). 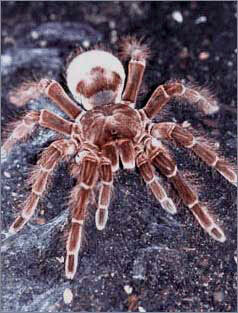 But the goliath bird-eating spider is pretty harmless to humans, as are most species of tarantulas. The biggest one on record was just over 11 inches across - as big as a dinner plate! They do carry venom in their fangs and have been known to bite humans when threatened, but the venom just causes swelling and mild pain for a few hours (like a wasp sting). Tarantula bites to humans are usually in self-defense and don't always contain spider venom - what is known as a "dry bite". The most dangerous thing about the goliath bird-eater is its ability to flick urticating hairs from its body at any creature it perceives as a threat, including humans. This is not a species of tarantula you'd keep as a pet. The tiny, almost invisible hairs that it voluntarily sends floating through the air are extremely irritating to our skin, and can cause real problems if they got into delicate mucous membranes around eyes and mouth. As hunters, tarantulas can be fearsome predators. Tarantulas don't have any special techniques, such as building intricate webs, or leaping great distances, for hunting their prey. They use good, old-fashioned stealth and strength, very much like wild cats. They sneak up on their prey and pounce on the unsuspecting victim, inflicting a fatal bite with venomous fangs. One fascinating feature of goliath bird-eaters, as well as some other tarantula species, is their ability to make noise. We don't normally associate spiders with noise, like we do with dogs, cats, birds, etc. We are accustomed to seeing spiders silently, stealthily crawling across walls, floors, and the sidewalk. But when feeling threatened, the goliath bird-eater is capable of making a pretty loud hissing noise by rubbing bristles on its legs together. Called stridulation, it can be loud enough to be heard up to 15 feet away! Tarantulas use their fangs for subduing their prey and carrying it to their dens (or to a safe location) for devouring at their leisure. They don't have teeth for tearing and chewing their meals so they regurgitate digestive juices onto their victim. These digestive juices break down the soft tissues so that the spider can slurp up its meal. All that's left when the spider has finished its meal is bones, skin, fur and/or feathers. The goliath bird-eating spider has been known to take young birds from their nests for its mealtime pleasure - hence the name "bird-eater". Tarantulas eat frogs, small snakes, beetles, lizards, and even bats.